the evolution of time and CPU over the execution of your software (as a percentage of what is allocated). BenchKit is of particular interest when you want to evaluate these measures on numerous inputs for a given program. You also confine the software execution up to a maximal execution time or memory usage. Compared to other solutions such as memtime, an efficient solution developed by the UPPAAL community, BenchKit is able to evaluate memory and CPU consumption of multi-processes (or multi-threaded) applications. a unique run identifier that allows you to access additional data. 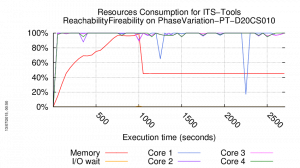 memory sampled at this time (percentage). From such a sampled file, one can generate the chart shown below (this one is selected from the MCC’2015). BenchKit is distributed under the GPL and available on GitHub. We are sorry but documentation is ongoing. a default private key corresponding to the public one that allows for connection in the VM. β2 (Apr. 14, 2013): Minor corrections and improvement for more stability, in particular with the use of top in the VM to extract memory and CPU information (still only one virtual machine per remote host). Once again in the context of the Model Checking Contest @ Petri Nets 2013.